Create a web project if you don’t have one yet. Select your project from the project navigation in the Dashboard. Click the Add website button in the right panel. Type your website’s URL into the URL field and click Create resource. 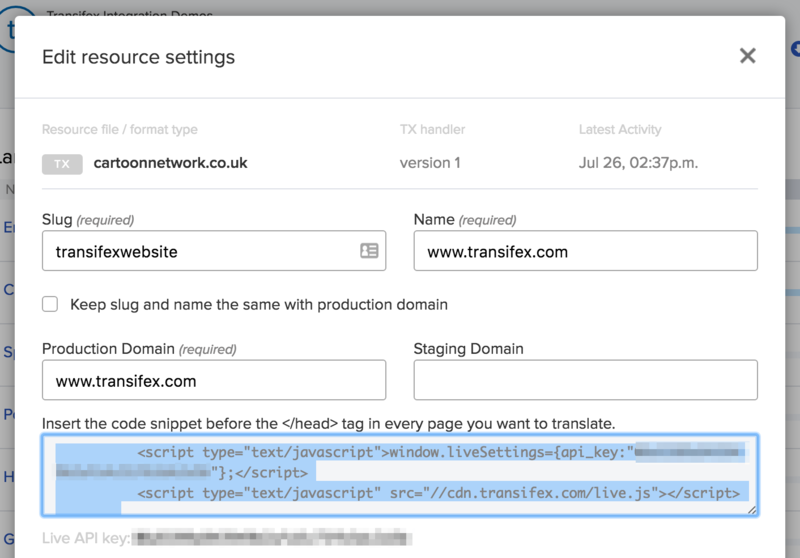 Each site you translate with Transifex Live (i.e. each resource) has a unique snippet associated to that site’s URL. Navigate to the Dashboard and select the project with the resource you want to get the snippet for. From the list of resources, click on the one you want to get the snippet for. In the header, click Settings. Copy the snippet from the popup. After you have copied the snippet, paste it before the </head> tag of each page you want to translate. And that’s it. You’ll now be able to trigger the Transifex Live sidebar on your site and approve strings for translation. Simply return to the Settings popup you copied the snippet from, enter in your staging domain, and hit Save settings.